Within minutes you will be able to beam your first picture with augmented reality! Watch the short intro video! Update your app’s content at any time, within minutes! 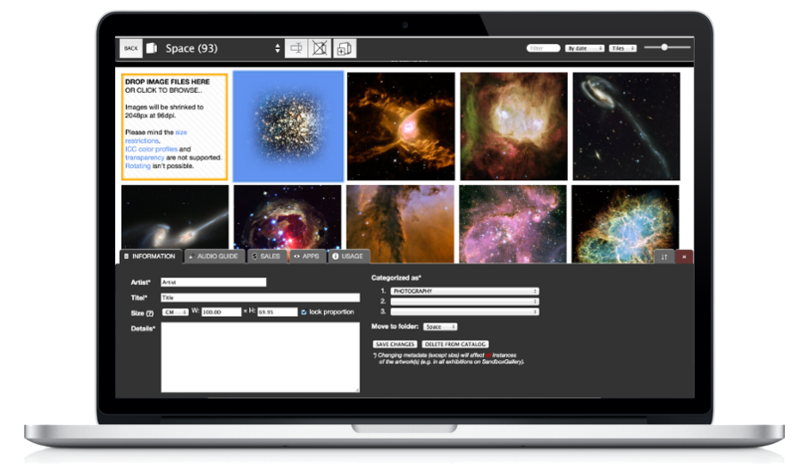 Sign in to our Catalogue Management System (CMS) to easily upload and manage your portfolio of artworks. Rename, add artist and description, tag by medium, add an audiofile, add different sales offer for different sizes and formats, link with your e-shopping system and select which artworks to make available in ArtBeamer. You can do all this from your webrowser. Use any computer, no software installation is needed. Customers will find you and your entire portfolio with a customized shortcode, or directly access a particular artwork. You can also limit access for particular artworks to a specific client, so that only he/she can see and ‘beam’ them. This is very useful if you want to make private offers and maintain confidentiality, e.g. when a collector at your gallery wishes to make a test hanging at home: simply hand him over the shortcode for a particular artwork. It’s easy for him to directly access it at home, by inserting its shortcode or scan its QR-code with the integrated scanner. Shortcodes and QR-codes are automatically generated through our CMS and can directly be made available to customers by e-mail, on your personal homepage, social media or e-commerce site or in your printed catalogues. Customers and collectors can browse your entire selection of available works and then ‘beam’ the art in the comfort of their own homes. The work of art automatically appears within the smartphone or tablet’s camera screen, and it appears as if on the wall, to scale, and in high resolution! 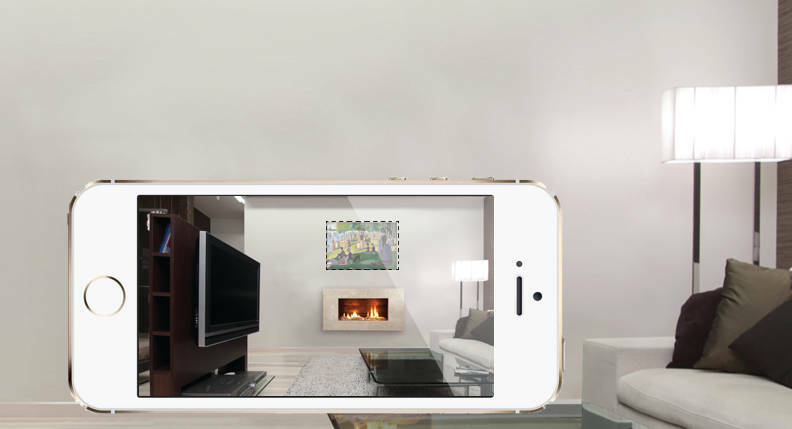 Through Augmented Reality the image can be viewed as if it were already hanging in the desired location; the app also automatically adjust the perspective. ArtBeamer fires up your customers’ imaginations. It helps them find the right work of art in the right size and then test it in their own spaces, enabling them to buy with confidence, even without seeing the original work of art in person. It makes your sales more compelling. Bring your printed catalogues to life! Add a shortcode (i.e. 12345) or a QR code to each image on your printed catalogue, invitation card or website. Your clients will immediately be ready to beam the artworks for testing, wherever they are! Each artwork has its individual sharing page. Just e-mail the link to the collector, and he will find your offer and an instruction on how to use the app. You and your clients can share your artworks on facebook, twitter, pinterest etc. Use ArtBeamer’s powerful sharing features to invite people to discover your creations. Experience Augmented Reality Now. Try It Free. Try ArtBeamer for free, with no risk. Your free trial is activated without requiring any credit card or paypal information. this basic plan allows you to start out even if you are on a tight budget. It includes all the features needed to boost your sales. Or save 2 months worth of subscription by billing annually for 99$. this plan allows you to customise the experience of your users and host a considerable chunk of your portfolio online. Or save 2 months worth of subscription by billing annually for 399$. this plan allows customisation and to host your entire portfolio, all your artists and artworks, worry-free and constantly available. Or save 2 months worth of subscription by billing annually for 799$. Our subscription trigger a monthly payment (apart if you choose the yearly plan). You are committed for the ongoing period (monthly or yearly), but can cancel your subscription anytime before the next period starts. We make it simple to start, and stop, at any time. For upgrading or downgrading just cancel the current subscription before the next billing period starts and start the new subscription. Contact us if you have any questions. Yes, we offer discounts on up-front long-term commitments: for a yearly subscription you get 2 months for free. Is there a fee on sales? Absolutely not. ArtBeamer don’t detract anything from your creative hard work, you keep the full income from your sales. 0% fee on sales is our policy to help artists grow. You start with a free trial with all features activated. We don’t collect your credit card until you’ve determined ArtBeamer is the right product for you.You can sign up here. Yes, you can unsuscribe at any time, the payment for the upcoming period will be stopped. You can do it by logging in, clicking “account”, and in the section “your active subscription” clicking “end subscriptions”. Do my customers need to subscribe to ArtBeamer or pay to use it? Absolutely not! ArtBeamer is and will always be free to use for your customers. ‘Beaming’ artworks is completely free of charge: the app is available for free in all App stores and always will. Then try it out for yourself for free! Start a free trial of 14 days now and enjoy the full package for two weeks, completely free! Whatever your needs, ArtBeamer can cover them. It doesn’t matter if artlover, artist or gallery, with a tight budget or interested in more exclusive offers: we have what’s right for you.